Dec 9, Moscow, RUS, LLC "Patriot"
38-38 twice and 39-37 Glazkov. Radovanovic won the vacant IBO female flyweight title. Gonzales won the vacant IBO Int´l superlightweight title. El Marcouchi was hurt after a clash of heads, went down and a cornerman entered the ring to assist him, which led to a DQ. Persoon retained the WBC female 130 lb title. Ivanov, down in the second from a left hook to the body, wore down Toutin and won the WBC Youth 168 lb title. WBFed heavyweight title - called off a few days before. No reason given. 80-71 on all cards for Hrgovic. Johnson, down in the second, was a late sub for Ytalo Perea and what was a scheduled WBC Int´l / 12 round fight was reduced to an eight-rounder. Bunn was floored late in the first but won on scores of 78-74 twice and 78-73. 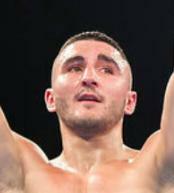 Radosevic won the vacant WBO Euro title. WBO Euro 175 lb title. Gebhard was down in the last. Sponza was down in the fourth but gave Elfstedt a very tough evening. Both suffered busted noses. Escanez won the vacant French 126 lb title. 39-39 twice Balandin, 39-37 Ahmadchon. Weiss retained the EU 147 lb title on scores of 118-110 and 117-111 twice. Olivier won the vacant French 200 lb title on scores of 96-93 and 95-94. The third judge had it 96-93 Deslaurier. Leonet won the vacant WBFed Int´l title on scores of 100-91 twice and 100-90.